Music studio teacher is excited to kickoff 2016 with a guest post from Dr. David Cutler. His new book, The Savvy Music Teacher is available here. On the surface, the suggestion that the best independent music teachers are those who earn the most money seems ludicrous. No obvious, mathematical correlation can be drawn between fiscal and pedagogical success. We have all encountered incredible educators who struggle to make ends meet, or financially comfortable ones who are mediocre instructors at best. Yet I argue that there is indeed a parallel. When done right, impact and income are closely related bedfellows. Savvy Music Teachers (SMTs) find ways to make them both go up, in harmony. How is this claim supported? It is difficult to devote 100% of attention to teaching excellence when tormented by problematic personal finance. Economic woes trigger a host of problems, inducing stress, strained relationships, and zapped enthusiasm. Individuals forced to take supplementary “day jobs” they despise just to get by, or those with unmanageable schedules and an unbalanced life, are unlikely to have time or energy to go the extra mile for students. On the flip side, a sound financial model increases likelihood that teachers find the psychological space to offer their best. It provides a foundation for maintaining a studio, organizing meaningful activities, pursuing professional development, and tackling passion projects, in addition to fulfilling personal desires such as buying a house or raising a family. Is there a more direct correlation? There is if you do things right. In order to increase impact, SMTs are known for employing teaching tools and strategies that expand beyond the average studio. As a result, their offerings are differentiated in innovative and meaningful ways, which translates to more students and higher fees. In addition, they offer a variety of products and services beyond lessons that enhance learning and revenue. Independent music teachers looking for a raise have an opportunity: imagine new, valuable musical experiences. Connect those initiatives to a sound economic model and, voila, both earnings and value rise. When writing The Savvy Music Teacher, I had the good opportunity to interview more than 150 independent teachers from across the globe (many are profiled in the book). Typically, I would contact them with a particular angle in mind: curriculum, policies, tuition model, studio management, etc. During these talks, however, the conversation often strayed in wonderful ways, exploring peripheral issues that were also parts of the model. We discussed challenge, opportunities, frustrations, and solutions. As a rule, instructors with inventive business models matched them with creative teaching approaches, and vice versa. For example, music teachers who generated substantial incomes were more likely to integrate improvisation, technology, and multiple musical genres than those who didn’t. That was a fascinating lesson. It seems that creativity is a transferrable skill. Those who master it benefit in a host of ways, creating simultaneous wins for themselves, students, and communities. Income and impact; money and meaning. These terms may not be synonymous, but for SMTs, they are closely related. DAVID CUTLER balances a varied profile as a jazz and classical composer, pianist, educator, arranger, author, speaker, and director of the world’s premier experiential arts entrepreneurship workshop The SAVVY Musician in Action. 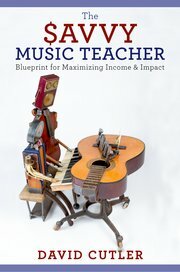 His books The Savvy Musician and The Savvy Music Teacher help musicians build a career, earn a living, and make a difference. Cutler serves as the University of South Carolina’s Director of Music Entrepreneurship. If this were to occur in the middle of the school year, it would definitely create a gap in my daily teaching schedule at least for some time, but, luckily the beginning of the year is a great time to re load when it comes to your studio. I have found emailing the parents of beginner students is usually a successful strategy when it comes to filling in holes in your schedule. Usually beginners are quite excited about instruction and this can provide a smooth transition in your schedule, so you do not miss a week of work at that specific time slot. Additionally you may try coming into their band class and doing a short performance to drum up interest. Also, in the beginning of the year I like to avoid telling a student I cannot fit them in the schedule until I have a concrete understanding of what my schedule looks like. For me, this usually takes about one or two weeks. Often times when students drop you can reexamine your schedule and find moving a few during the school day lessons around can often times erase any gaps that can pop up, and simultaneously allow you to create time for students you were not sure would previously fit. Scheduling of Fridays after school: It is difficult to maximize the number of students when Friday after school Is consumed by marching band performances. To counteract this I either teach at a middle school or a private school, which has no marching band, on Fridays. It is difficult to maximize your studio potential when Fridays after school hours are being lost to football games. This strategy has given me the best result for weekly Friday after school teaching. A few years ago I ditched the bag I was bringing to all my lessons, and went paperless. This has been a revolution for my teaching,, and I thought I would share some of the benefits. I bought at 32 gig iPad with cellular data capability for this occasion. My school wifi accounts were so restricted it was impossible to use the internet for the purposes of teaching music. So, some type of mobile device is obviously required for this. 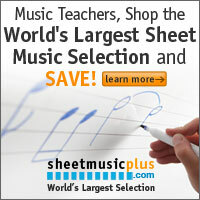 Preferably something with a screen large enough for you or your students to read music from. The good news is this purchase can be one of your many tax write offs for the year. Communication increased significantly for me once I went paperless. I could respond to emails in between lessons during the day, rather than dealing with fifteen to twenty unread messages later that evening. My amount of paperwork decreased dramatically. I was able to do all my scholarship paperwork using a type on PDF app. I was acquired the necessary student signatures via the pen function of this app, and then emailed completed paperwork to the band directors. This has become a major timesaver at the end of each month. I used google documents to upload my weekly teaching schedule, as well as to edit the document with who has and has not paid for their lessons that month. Google drive also became a valuable asset for me. I uploaded pdfs of the material I work with my students on to my google drive. Then, when a student forgets his or her music, its right there on the iPad. With the cellular data working on my iPad I was always able to call up these files when necessary. Additionally I was able to play recordings for my students via the iPad from my own music collection or YouTube. This also works well for play along backing tracks for jazz studies, or playing a drone for tuning. Lastly, I used this device to record students performing, with their permission. Students could listen back and determine how they are playing a passage. With the iPad I was able to eliminate bringing my hard copy schedule, notes on who had/hadn’t paid, solos, etudes, and monthly paperwork. Additionally my drive home was enhanced by using the Waze app for real time traffic info and better driving routes to avoid rush hour congestion. Now, all I need is my horn, iPad, and a pencil when teaching lessons.